It’s hard to know if your pricing strategy is the right one to maximize returns at every stage of a product’s life cycle. And there is added external market pressure to make the best decision across geographies. 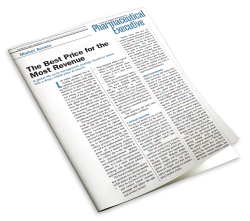 For instance, many governments are increasing scrutiny of the clinical value a product brings to the market. Knowing the right price is critical – and you need a global perspective to be successful. A background and current status of pricing in life sciences. The role of advanced analytics to improve global data analysis, pricing and negotiations. Tactics to create a cross-organizational pricing center.